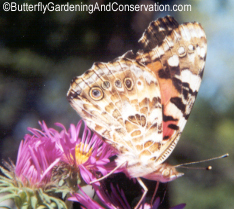 Painted Ladies have the largest range of all butterfly species, being found in all of the US and Canada and many other parts of the world. They spend their winters in southern US and migrate north to northern states in the summer. Host plants are many and include thistle, Borage (Borago officinalis), Hollyhock (Alcea rosea), Yarrow (Achillea millefolium), Malva (Malva sylvestris), Sunflower (Helianthus annuus) and Plantain (Plantago lanceolata). In my garden they seem to prefer Borage (Borago officinalis), but my Hollyhock (Alcea rosea), Yarrow (Achillea millefolium) and Malva (Malva sylvestris) have yet to grow as well as they should. I haven't seen any signs of them on Sunflowers or Plantain. Adults feed on flower nectar. Eggs are light green and laid singly on host plant leaves. 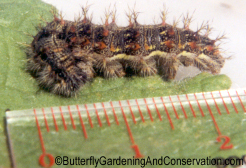 Caterpillars make nests in the leaves with their silk. Early instar caterpillars, probably 2nd and 3rd instar. See ruler for size perspective. 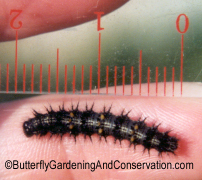 Middle instar caterpillars, probably 3rd or 4th instar. 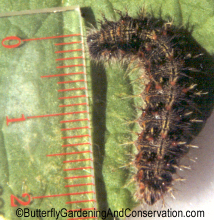 Late instar, same as on right, but close up. Late instar, making nest in borage. 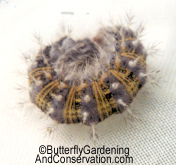 5th instar curling up and 'playing dead'. 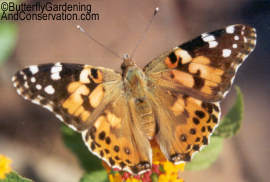 When Painted Ladies are ready to pupate they hand upside down from an appropriate place. Then they molt once last time to form a chrysalis. 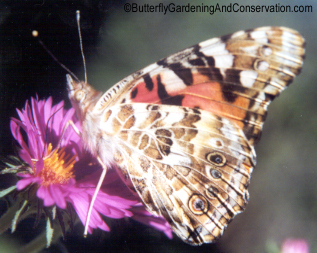 Adult Painted Lady from side, nectaring on New England Aster. Adult, wings closed, nectaring on New England Aster. 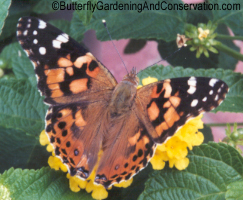 Adult, wings closed, nectaring on Lantana. 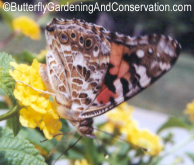 Adult, wings open, nectaring on Lantana.